Internet is growing day by day thousands of people buy 3g dongle/net setter or modem to surf the internet on their pc or laptop. Why people buy 3g usb dongle? Because it’s the coolest way to connect to internet anywhere with your laptop or tablet in car, house, park, club, party etc. You don’t need to seat in your computer room with a wired modem. But when we buy these 3g dongle they are locked with a specific sim operator. You can use only that operator which is provided with that 3g dongle. Suppose their 3g plans price won’t go low. But another operator gives faster speed with cheaper price. Will you buy another operator dongle? Answer is NO. You don’t have to spend money on new dongle. 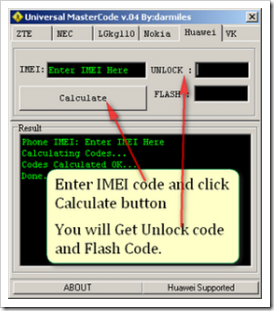 I will show you simple ways to unlock your 3g dongle. So you can use any 3g operator sim with same dongle that you have. Well there are many software to unlock your data card by entering unlock code. You can get that unlock code from few softwares like universal master code. you can get this software on google by searching for "universal master code" download it and enter your data card IMEI number and it will calculate your unlock code. One of my friends tried this way of huawei modem unlocking.But she got fail and her maximum unlocking possibilities also finished.So she suggested don't try this way of unlocking.Better try any one of the online unlocking service.So i unlocked my modem with a help of SuperUnlockCodes.com I never had any problem.